With the great effort of our R&D dept, Sublimation101 concerns every branding possibility in our daily life by sublimation. 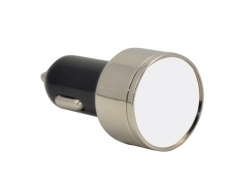 Right now, the car charger is coming into reality, with USB port for easier connect and sublimatable aluminum sheet for professionalization. With it, you will be no longer worried about your device out of battery again while enjoying driving.